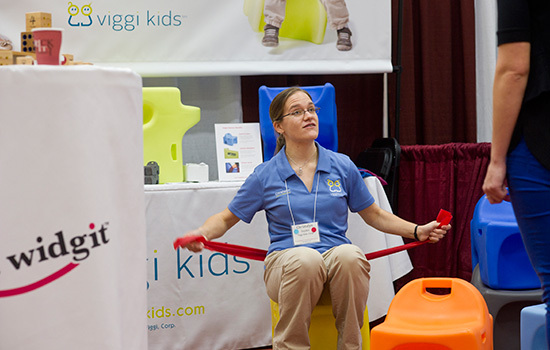 Viggi Kids Corp., makers of inventive children’s products that encourage natural and healthy movement, was one of companies that received funding through New York state’s Minority and Women-owned Business Enterprise Investment Fund. Here, Christalynn Duff, a 2011 graduate of RIT’s industrial design program, demonstrates one of the products at the Effective Access Technology Conference in 2015. Four early-stage companies launched at Rochester Institute of Technology have received more than $1 million through New York state’s Minority and Women-owned Business Enterprise Investment Fund. The companies have also received more than $1.9 million in private matching funds and are expected to create additional jobs in 2018. The announcement from Gov. Andrew Cuomo’s office was made earlier this month. • IMSWorkX Inc. (Rochester, N.Y.) was founded by RIT graduate Shannon Chevier ’99 (software development and management). IMSWorkX Inc., launched from RIT’s Venture Creations business incubator in 2015 and is a telecommunications software company providing service layer applications and solutions for the emerging all-IP communications network. The company was awarded $42,000 from New York state. • Molecular Glasses Inc. (Rochester, N.Y.), which was founded by Michel Molaire, focuses on technology that converts materials to noncrystallizable and soluble molecular glasses—without affecting their original photo physical properties—for stable and long-lived organic light-emitting diodes and other organic electronics. According to Molaire, the materials will be used to manufacture large-sized televisions, smartphones, tablets and commercial-lighting modules. The company, a client of RIT’s Venture Creations business incubator, also advanced to the final round of the 2016 Rochester Venture Challenge business competition. The company was awarded $100,000 from New York state. • Splyce Inc. (Rochester, N.Y.) was founded in 2015 by RIT graduate Marty Strenczewilk (environmental, health and safety management), and is a multi e-sport company that fields nine professional e-sports teams across League of Legends, Call of Duty, Overwatch and more. The company is also a 2016 graduate of RIT’s Venture Creations business incubator. In February, Splyce signed a deal with Delaware North, a global food service and hospitality company, to enhance Delaware North’s e-sports offerings. The company was awarded $500,000 from New York state. • Viggi Kids Corp. (Fairport, N.Y.) was founded by RIT industrial design graduates and former adjunct professors Sandra Turner ’12 and Christalyn Duff ’11. The Viggi Kids’ line of children’s products encourages natural and healthy movement that promotes calmness, improves concentration, focus and attention in the classroom, and reduces tension and frustration. The company was awarded $250,000 from New York state. The Minority and Women-owned Business Enterprise Investment Fund provides equity to support innovation, job creation and high-growth entrepreneurship throughout New York by investing in state-certified minority and women-owned businesses. The complete list of companies receiving funding from New York state’s Minority and Women-owned Business Enterprise Investment Fund can be found here.